Following the visit of US Secretary of Defence James Mattis, the media has been agog with analysis of the visit. By and large, strategists are at one in agreeing that the visit signifies a deeper India-US engagement in Afghanistan, particularly following the rolling out of the Trump administration’s Afghan strategy and India’s own quietly announced "strategy" as outlined in the joint statements of the Second Partnership Council meeting held in New Delhi recently. While everyone agreed that India is expected to step up to the plate with a larger role, there is some hesitation in actually enunciating exactly in which areas India can "do more" as demanded by the US president, and more importantly, what more India can do to advance its own interests. An ideal India-US effort would be one that would marry both these lines of activities as far as possible, into specific areas on the ground. 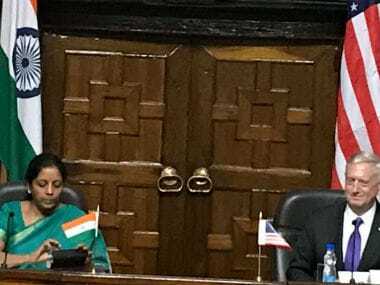 Some of the plans for expansion of Indian development activities – which is after all the main plank of Indian presence in Afghanistan – is already outlined in the joint statement at the end of the meeting of the Partnership Council. For one, the air cargo corridor is to be expanded to other cities besides Kabul. This is a vital development and extends trade opportunities for Afghans from various provinces across the country. If India wishes to accommodate US interests, it is possible to twin this capability towards providing US forces non-lethal logistics for its troops. The troublesome logistical chain that goes through Pakistan remains prone to attacks by hostile elements whenever the Pakistan government is miffed with the US. These lines of communication that entered Karachi from the sea, towards the Afghan border were vital when the US troop strength was climbing to a hundred thousand. With the present total likely to be at about a fifth of that figure, the logistical chain can be easily replaced by India. Taking this role is risky given that it shifts the focus away from India’s consistent development agenda, but the point being made here is that it can be done. A less risky option is that of using our air cargo capability to transport in requirements for Afghanistan's security forces. Overall, both or either of these will result in Pakistan losing whatever existing leverage it still retains as a logistical node. The second instance of India's pure development agenda is the announcement of 116 high-impact projects in 31 of the 34 provinces in Afghanistan. With only three provinces left out, this appears to be an effort to spread out Indian aid into as large an area as possible, and thus benefit a larger number of Afghans. While this is commendable, it risks aid being divided into penny packets. Ideally, aid needs to be concentrated towards an overall Indian objective. infrastructure. A trade corridor will succeed only when it is seen as improving the lives of local people in these provinces, a lesson that China should learn as it pushes through with the China-Pakistan Economic Corridor in Pakistan-Occupied-Kashmir, where locals oppose the CPEC on the grounds that it does nothing for them. A trade corridor through Afghanistan should serve the US strategy as well, which specifically stated that Afghans cannot expect a "blank cheque" but must carry a part of the economic burden. To be able to do this, Afghanistan has to be enabled to maximise its exports. The hiccup here is of course whether the US would reconcile to the fact that Chahbahar in Iran, is the only viable exit for such a route. A nod from the US would give a fillip to a trade corridor, and open up Indian assistance in the setting up of the entire gamut of infrastructure including warehouses, power and most importantly, banking and financial institutions to back this. Afghanistan’s ability to pay for itself, and thereby reduce the costs to the US — which is apparently a bugbear of President Trump — is dependent on such an initiative. A third issue is one that received only a passing reference in the India-Afghanistan Joint Statement, and none at all in the US strategy. This is the question of narcotics. Afghanistan continues to be the largest opium producer in the world, with opiate production surging every year after a brief dip in 2015. What is of even more relevance to the war in Afghanistan is that an overwhelming 85 percent of areas under cultivation are under Taliban control or areas of high influence. Simply put, an erosion of the narcotics trade would seriously hit Taliban funds and Taliban leaders personally. Leaders like Maulvi Abdul Zahir, formerly agriculture minister in the Taliban government, is known to be heavily involved in narcotics trafficking. Another drug lord was a minister for Haj and religious affairs. Analysts now believe that the Taliban are a drug cartel in the fullest sense of the term. In fact, a large part of the fighting is believed to be dictated by the need to exert control over drug routes or cultivation areas. Witness the jostling for Badghis which is the entry for trade into Russia and the almost unending fight for Helmand, the wellspring of drug cultivation. Unsurprisingly, the nodes of finance are in Pakistan, often under the control of Taliban leaders or their cutouts. It is hardly likely that Pakistan Intelligence would be unaware of its activities. Indeed, with much of drug money being banked in Pakistan, it is entirely possible that this segment this forms a significant part of Pakistan’s own economy. Analysts have argued reasonably that fighting the Taliban, while allowing them to rake in the profits of the drug industry is like trying to empty out a well with a bucket of water. Counter Narcotics experts in their turn have called for a complete and effective ending of narcotics production with the use of aerial spraying among other methods. However, US officials and aid agencies feel that such a move would ruin Afghanistan, and add unemployed youth to the ranks of the Taliban. In this assessment, they are only partly right. They forget that in the 1970s Afghanistan was once self-sufficient in food production, and a net exporter of agricultural produce, including dried fruits and nuts, or derived from agricultural products including karakul skins, wool, cotton, and rugs. This long-lost capability can be revived, if India and the US work together to knit projected Indian assistance in hydropower and irrigation, to US counter-narcotics expertise. Certainly, such an effort will have to move district by district, eliciting local support in these areas. The realities that underlie the basis of a counter-narcotics strategy are simple. Data indicates that there are some 80,000 growers and their families, and another 4,80,000 itinerant agricultural workers. This is a formidable figure and certainly, indicates that efforts towards alternate crops will have to be slow. But here’s the really notable figure. Actual traders and traffickers are less than 10-20,000. That means that the core of the counter-narcotics programme has to be carried out by the US in Pakistan, even while India carries out an alternative agricultural programme. This is a partnership that ideally, even Russia could be persuaded to cooperate with, given the serious security implications from the narcotics surge. The 'endless war' in Afghanistan is at a critical juncture, where the US has definitely indicated that it sees a strong Indian role as beneficial to its own objectives in the war-torn country. Conversely, it has identified Pakistan as the main culprit. Indian objectives should not, however, be dominated by a desire to be one up on Pakistan. While retaining all capabilities and initiatives to end terrorism emanating from Pakistan and the bloody nexus with narcotics, an overall effort aimed at stabilisation of Afghanistan could include Pakistan in areas where it has a capability or shows a willingness to assist. For instance, Pakistan Army-led anti-narcotics force has a formidable capability. Consultations between Indian, Afghan and Pakistani narcotics teams may sound like the stuff of nightmares at present. But the seeds have to be sown for cooperation. Their germination will depend on whether Pakistan can be kept isolated by major powers until its own leaders decide that cooperation is better than castigation from international podiums.